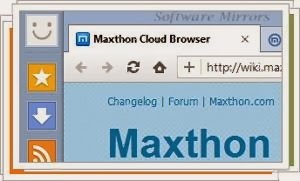 Maxthon Cloud Browser is a web browser that uses the WebKit engine in addition to Internet Explorer for full compatibility and adding a more features that makes it more user-friendly and faster than IE. The interface is nice and very much like a cross between Internet Explorer and Google Chrome. Unlike previous versions of Maxthon Cloud Browser now makes a minimalist appearance, with just a few buttons. Additional features include Maxthon Cloud Browser is popup blocking and advertising, autofill forms, mouse gestures, smart address bar, integrated download manager and much more. If you think the battle of the browsers is limited to IE, Firefox, Chrome, Opera and Safari, think again: Maxthon Cloud Browser also want to take part.